In ancient Egypt, sphinxes are represented with the body of a lion and the head of man. This is the most famous of all Egyptian sphinxes near the pyramids. The Sphinx was carved from a single block of limestone left over in the quarry used to build the Pyramids. 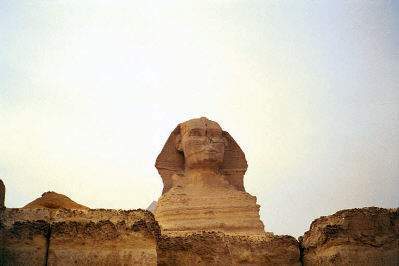 It was sculpted about 4,600 years ago by the pharaoh Khafre, whose Pyramid rises directly behind it and whose face may be that represented on the Sphinx. The sphinx is about 66ft high and 240ft long. The Sphinx has recently undergone a major modern restoration.